How to Play: The Chameleon is a simple deduction game similar to Spyfall; however, it also adds in an element similar to Codenames. 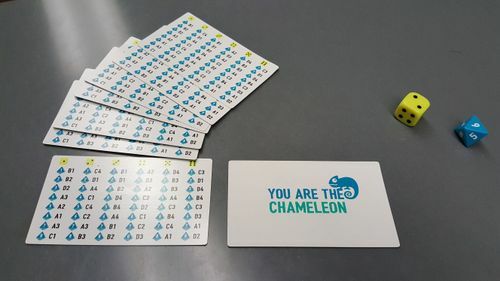 Each player is given a card, and this card either contains a grid (more on that in a minute) or the phrase “You are the chameleon.” One player rolls a yellow die and a blue die. Anyone who has the grid can determine what the secret word will be for that round, but the chameleon is left to bluff his/her way through. After players use the grid to find that round’s secret word, all the players come up with a one-word clue about the word. During this time, the chameleon typically tries to find a clue that would work for many options. For example, if the card contains all food words, the chameleon could use the clue “hot” and hope it’s a hot food. Players give their one-word clues quickly and in order around the table, and then they try to determine who’s the chameleon. If the chameleon is caught, s/he gets one chance to guess the secret word. If players’ clues were too specific, they might end up losing the game as a result. 1. It’s a neat brain exercise. Being the chameleon causes players to think on their feet. They must either come up with a generic clue or try to quickly figure out, based on others’ clues, what would make sense to say. My favorite strategy is to come up with two words and then use the one that fits best with what others are saying. If you’re not the chameleon, you must still give clues that aren’t overly specific. 2. They included plenty of categories. And even if you don’t like the ones they provided, there’s a whiteboard and marker to create your own categories. 3. It’s very simple to teach and to play. My high school students can easily pick up all the game’s subtleties (how to give clues, how to blend in, etc.) within five minutes of playing. 4. It’s two kinds of games. The Chameleon has social deduction and word game elements, which makes it a nice fit for most players. 1. There were more information on which to base your social deduction. Sometimes the game falls a bit flat because two or three people give terrible clues or repeat each other. When you’re basing your judgment off one word, this can sometimes turn into a bit of a crapshoot. 2. It supported more than eight players. I think you could easily play this game with 10-12 using two chameleons. It’s a simple, quick party game, so the more players it can support, the better. 3. The graphic design were more appealing. The grid cards and the box don’t do much for me aesthetically. This doesn’t affect gameplay, though. Overall: The Chameleon is a solid filler for the price if you can find it 50% off at Target (this happens frequently). I want to be clear: I enjoy playing The Chameleon and find it to be an enjoyable game. 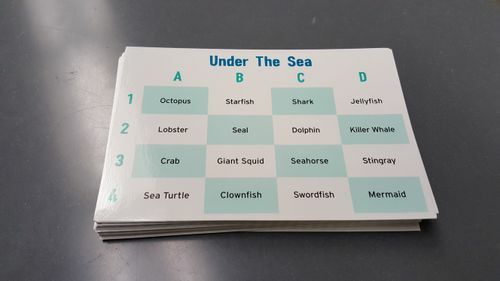 Coming up with clues can be really challenging and fun, and the social deduction aspect, though limited by the one-word clues, keeps the game interesting. However, the more I play, the more I feel like the game is somehow incomplete. Because you’re basing your deduction off such a limited amount of knowledge, the ending of the game sometimes feels random. I think this would be far more problematic if the game were longer, though. One of the best aspects of The Chameleon is that you’re looking at 3-5 minutes per game, so you can run a number of rounds in a row. Some games will feel robust and satisfying, and others will probably fall flat. Either way, The Chameleon is worth picking up. It has wide appeal and would work with family, friends, co-workers, strangers, and even most kids.